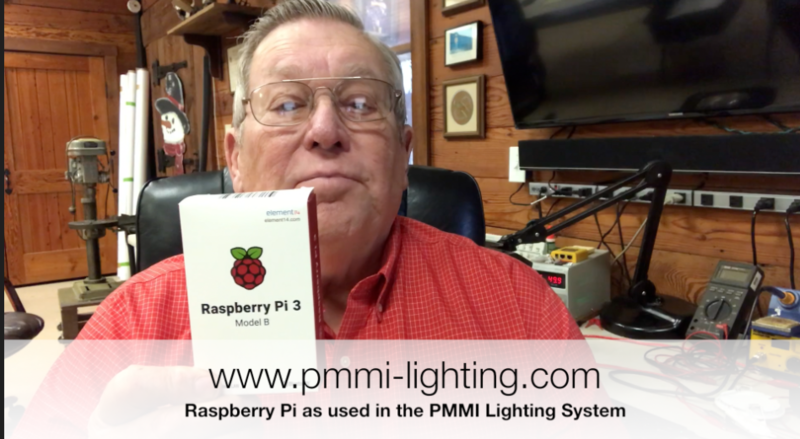 Let me explain the Raspberry Pi that we use in our Lighting System for those of you who aren’t real familiar with it. This is a complete computer. Comes in a real nice little bag. This is what the complete computer looks like. It’s a little different than most of you are use to using. It is a complete computer in that it has a port for an HDMI cable to run a monitor, it has a port for the Ethernet, it also has built in Wifi, and it has four USB ports. In addition to that, there is a complete row of headers that we utilize when mounting it on our Raspberry Pi Board that we build to communicate with the rest of the system. This is what we mean when we refer to a Raspberry Pi computer. Now let me show what it looks like when it is installed on a board that we build, our Raspberry Pi Board. This is part of the test system I keep running on my workbench all the time. This shows a Raspberry Pi that is mounted on our Raspberry Pi Board. On the Raspberry Pi Board we have included a power input, a power supply, and then back here are level translators. The Raspberry Pi runs at 3.3 volts and the rest of our system runs at 5, so we have to transfer all the levels from 3.3 to 5 volts to be able to talk between them. This Raspberry Pi has a monitor plugged into it and a key board plugged into it. This is a little blue tooth transmitter and down here we have a USB port where we plugged in our USB drive. That shows our configuration of how we configure the system to operate. It in turn takes that and translates it and runs it to our controller. Let me now show you what the monitor looks like that we have running on the Raspberry Pi. This is a picture of the 42 inch monitor that I have the Raspberry Pi running on my test bench plugged into. You see it has no problem driving a big monitor at all. Got a picture on the desktop of our PMMI Lighting logo. Gives us something better to look at than what normally comes on them. So to show you this is a regular old computer, let’s say we want to check our email. I can open up the email and right here we can open it up and stay current on the email, read them, can send new emails if we want, just like a regular one. There is where we can compose them, nothing abnormal, might look a little different, but it is a regular email program. Now if we wish to browse the web, let’s open that up. This is a program I use for every system that we ship. We have to input the latitude and longitude into every system so they know when sunrise and sunset is. This is for a system that went into Manson, Iowa. I just typed in the name and it gave us the latitude and longitude for Manson which I can input into the excel spread sheet. Ah, there it is loading our PMMI web page, this is our web page which you have all probably seen. We can go to the gallery, we can scroll down. If we have some pictures we want a bigger view of, just click on it and there it is. This is the kitchen, front hall area of our test home. We can go ahead and close this. Over here if you wish you can come down, you have calculators, file managers, PDF viewers. Almost everything you’ve got on any other computer. I just wanted to give you this brief introduction of what the Raspberry Pi computer is and how we use it. It is the front end of our entire lighting system. It is the way we communicate, it is where we input the program, so that the controller knows what to do. It is the smarts for our entire system. I was very happy to find this site.I wanted to thank you for this glorious learn!! I am positively having fun with each little bit of it and I have you bookmarked to take a look at new stuff you post.